Maria Giudice is a people person, particularly when it comes to product design. She’s currently the Vice President of Experience Design at Autodesk, a maker of software for makers themselves – architects, engineers, industrial designers and construction teams are all users of their more than 140 products. Maria’s challenge, one she embarked on a year and a half ago following her run as Product Design Director at Facebook, is to make sure each of those products provide a consistent experience that puts users first. Prior to Autodesk and Facebook, Maria founded the influential experience design firm Hot Studio. She has written several books on design, and her latest, coauthored with Christopher Ireland, is Rise of the DEO: Leadership by Design. In my chat with Maria, we cover what it means to be an experience-centered company, why everyone in your company needs exposure to customers, how to tackle guerrilla research, and much more. If you like what you hear, check out more episodes of our podcast. You can subscribe on iTunes or grab the RSS feed. Silos are a major blocker to creating great user experiences. They lead teams to work in the best interest of their specific group, rather than the organization. It’s the job of everyone, from the CEO to interns, to get exposure to customers. This can be ethnographic research, support conversations, qualitative studies – even joining the conversation in online forums. Research should be a continuous input to your developmental cycle, and any research is better than no research. As you design at scale, even the tiniest adjustments can have massive ramifications. Product builders must learn to test, iterate and evolve as they roll changes out to the masses. Adam Risman: Maria, welcome to the show. To get started, could you summarize the work you’re doing at Autodesk and what unique challenges led you to joining such a large, global company with more than 140 products? 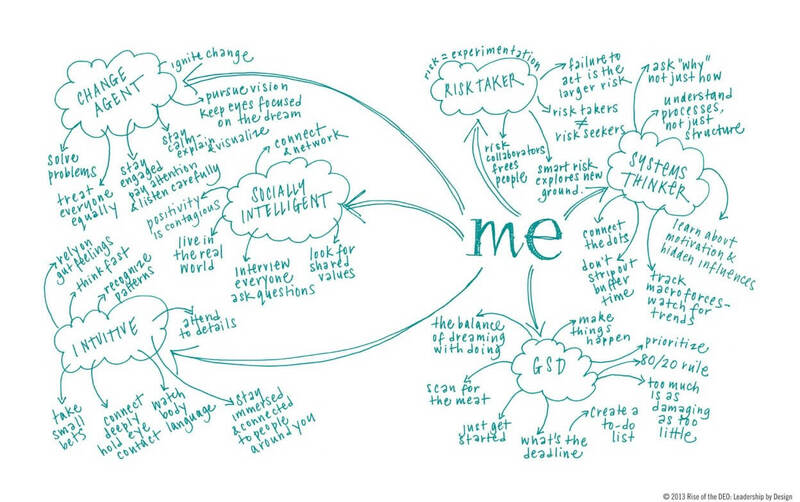 Maria Giudice: My current incarnation is Vice President of Experience Design at Autodesk. I’ve been in the role for about a year and a half, and one of the reasons I was really attracted to this role is that Autodesk is a great company. They were actually clients of mine back when I was leading Hot Studio. Also, Carl Bass, the CEO, is featured in my book as a DEO, so I had a lot of affectionate affiliations for the company. Autodesk, like so many companies that preceded the internet, was born as a technology company. Autodesk is 34 years old and it got it’s fame and fortune from AutoCAD, and from AutoCAD, it grew to support architects, engineers, construction people, makers, industrial designers, and all those are manifested in the suite of products. The company is rooted in technology. 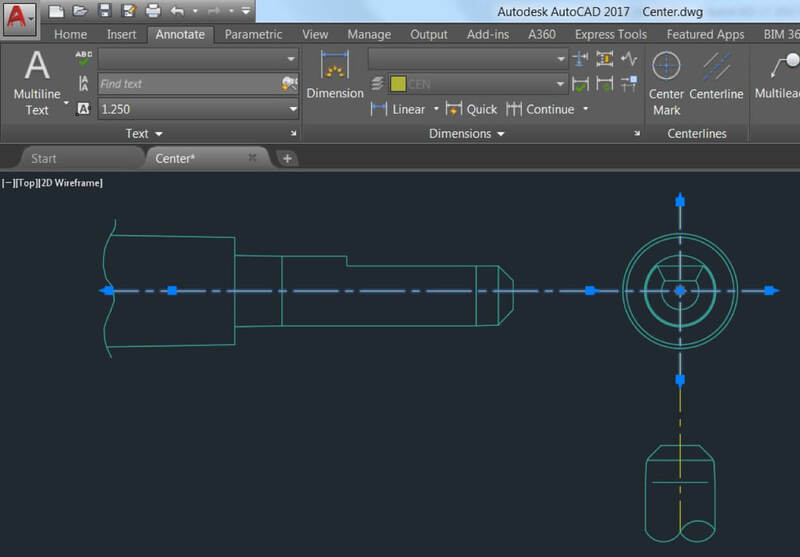 AutoCAD, a commercial design and drafting software, was first released in 1982. Prior to the internet, we were just happy when technology worked. We were grateful. I remember the days of Photoshop 1.0. You would rotate an object and then go to sleep, and by the time you’d wake up the object would finish rotating. We were happy, it was a miracle, but those days don’t exist anymore. We have whole generations of people who not only don’t want to think about technology, they expect it to work, and it’s more about driving a better experience. That becomes a competitive differentiator and it will drive the market. Autodesk has to grow up, like so many companies, from being technology-centered to becoming experience-centered, and that is an awesome problem to try to solve. Adam: That must have required one hell of a culture change, so what exactly are the tenets of a healthy experience-centered design culture? Maria: First of all, change is really hard. People hate change, but Autodesk was ripe for it. Moving from technology to experience-centered, the first thing is admitting that you need to do that. That’s half the battle. If a company knows they are rooted in technology, and they realize they have to modernize and become an experience-driven company, that realization is the first move. Then it becomes an issue of how. First of all, a company that is experience-centered are insane advocates for their customers. They know who their customers are, they believe in research to drive insights, and they’re making business decisions and technology decisions based on what customers need, want, and desire. Traditionally, companies would really think about what their business drivers are or what the technology can do and back into how to serve that customer. It’s the opposite with an experience-driven company, you start with people. That’s the first driver of a healthy company. The other one is to get out of silos and start thinking in systems. A lot of traditional companies are organized through silos and you live and die by the org that you’re in. Oftentimes, you may not be working in the best interest of the customer because you’re actually working in the best interest of your organization, or you’re not really seeing the seams of your organization. You don’t see that those seams, in fact, get exposed to customers. Adam: A lot of times you might be passing those silos along your customers too. When they see an inconsistent experience, it’s probably because there was a hand off from one team to another when there should have been collaboration. Maria: A very healthy company is actually thinking about their company as a series of systems and connections. A large part of my job is to work across the company to unify and simplify those connections on behalf of our customers. Adam: You’ve hinted at these a little bit, but what were the patterns or root causes you identified at Autodesk that were blocking this? I’m sure they’re not unique to Autodesk. Maria: Not unique at all. When I joined Autodesk, my boss asked, “How are you going to start, what are you going to work on?” I don’t know, but one thing that I have been trained to do, and this is in my book, is treat every problem like a design problem. Any business problem can be a design problem, so you follow a design process. The very first thing I did was go on a listening tour. I said, “Give me three months.” There are 9,000 employees at Autodesk and I was going to try to listen to every single one of them. Now, that’s not possible, but I did manage to listen to hundreds of people and it was all the way from the CEO down to interns. You don’t go for the organizational hierarchy, you cut across the organization and you talk to people. I asked them a few questions – what keeps you up at night in your job, what’s preventing you from doing a good job, what are your hopes and dreams, and how can I be of help? Building a strong culture is relevant no matter what size you are. From that, I collected the symptoms. Big one is silos. In every company there are organizational silos that get in the way of innovation. Another is the mindset about design in and of itself. A lot of companies don’t understand that design is a verb, not a noun. Design is not a thing a few people do after the fact, it’s part of the process. It’s not an outcome, and in fact, everybody’s responsible for it. Agile becomes this magic word that means many different things, depending on who you’re talking to – inconsistent agile processes, a lack of unified understanding of who their customer is. Every org has their customers and they think they’re special, so they have special use cases for their special customers. Then you have this real complex understanding of actually who we’re trying to serve. Those are just a few of the symptoms that I uncovered along the way. Adam: Thinking of those that are more in the earlier stages of their company’s developments, what can they do ahead of time to keep those blockers from emerging? Maria: I ran a company for 15 years, which started with one employee and grew to 100, so I completely understand the pain points when you’re one person, 10 people, 25, 35, and 50, and then 75 and above. Each size has a very different set of problems, but there are consistent growing pains that cut across. Building a strong culture is relevant no matter what size you are. If you think of Maslow’s hierarchy of needs, where you put culture on the bottom and quality at the top, you can’t really talk about shipping quality work until you actually have a culture where people feel that you’re listening to them, that they feel heard, appreciated, and like part of the solution, that you’re motivating them to do their best work. All of that stuff happens at the very, very bottom. That is true whether you’re 10, 25 or 50. I would argue as you get bigger you have to pay more attention, because it’s easy to lose sight of culture. Adam: As you get bigger there are also more layers of the actual business to permeate through. How can design leaders show the value of change to those people that are less familiar with the mindset they’re approaching problems with? Maria: How do you justify investing in change? That’s a hard one, right? Because, for me, Autodesk acknowledged they needed to change and I came in as a change agent. In a lot of ways, the heavy lifting was already done for me. For people who are inside a company and want to be change agents, there are many different ways you can do that. First, find your tribe. Who are the people in the company that are like-minded? Who are the people that you can unionize to conduct a movement or a revolution? There’s this great video clip that I saw at a TED conference about how to start a movement (embedded below). It talks about the lone nut, and it’s not really the lone nut that creates the revolution, it’s actually the first person that believes in the lone nut. The first follower actually becomes the change agent, and then people follow the follower, and that’s how you build a momentum to drive a wellspring change. That’s a bottom up approach. The top line approach to change is ultimately getting to quality and customers. If you’re going to have a better culture, if you need to invest in design, what are those levers that are going to improve customers’ experiences and how do you measure that? How do you show customer pain? I think everybody in their company should do a customer tour of duty. Every single person. There are people at Autodesk, and like other companies, where you’re working on a product and you’re actually not even using the product that you’re actually designing. Use the product. The other thing is listen in to customer complaint calls. You want change to happen? Have your CEO listen in to a customer complaint call. Have your middle managers listen in to angry customers. Have your middle managers, who are usually the troublemakers, actually walk through a customer scenario themselves. It should be part of every person’s job to be exposed to customers. This could be ethnographic research, trawling the forums, listening to customer complaint calls, qualitative studies, but it should be part of every person’s job to be exposed to customers. When I was working in the early days of the internet, Schwab was one of my clients. One of the things I thought was brilliant was the VPs at Schwab had to do customer calls, they had to actually do support on behalf of customers, and I thought that that was the most amazing idea. Talk about instant empathy. When I talk about research, it’s really exposure to customers. Adam: That’s probably much more difficult to do at a company your size than, say, an early stage startup. Maria: An early stage, bring your entire team on customer calls, don’t relegate it to the designer or the PM or a sales channel. The development team, the PM team, the design team, they should all go and participate in research together. Because when you actually delegate a person to go do research, they see the burden, and then it’s their job to express what they saw to stakeholders. If you send a whole team out for a day and do ethnographic studies, then they come back with shorthand. You don’t even have to do a report. You could be, what was the big insight, what was the thing that we saw? Can we agree that we have to fix that? It makes the process move so much more efficiently. Adam: Everyone knows the importance of research, but resources can often be scarce for an early stage company. What sort of low friction ways can they do research? When I was in the early days of Hot Studio or when clients didn’t believe in research, they didn’t believe in paying for it, we would do guerrilla research. One of my clients was SF MOMA, I had the entire development team hang out in the lobby and ask people questions. They came back and they had that insight that really drove the product decisions on behalf of SF MOMA. 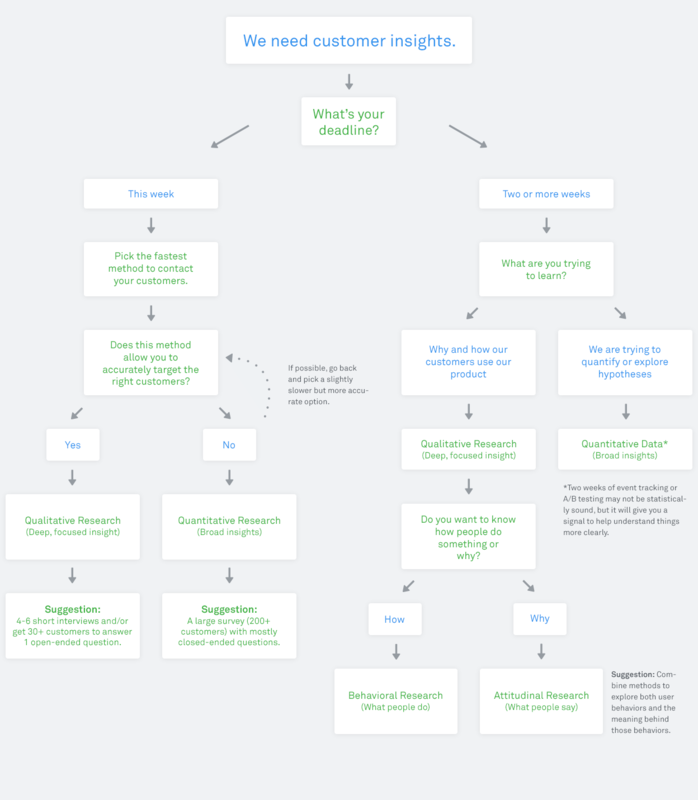 How to approach research with very limited time and budget. Click to enlarge. Total guerrilla research. You have to do a combination of quantitative studies, like surveys looking at analytics, and you have to use qualitative studies. Because if you solely go by analytics, which a lot of people do because it’s easy, it tells you the what but it doesn’t tell you the why. Quantitative studies don’t allow you to ask follow-up questions. Qualitative gives you the richness of the why, but it may not give you the justification based on numbers alone. You have to have a combination, and there are a ton of quick and dirty methods that will get you results. Research should be a continuous input. It’s not like you carve out research and say, now, we’re going to do research. Research should be a continuous input that is on top of a development cycle. The other argument you hear is that research slows down the development team. No, not when you have a research plan from beginning to end. When you’re actually doing agile and you’re doing sprints, it never really ends anyway. You use research as top line checks and balances. It’s not just about validation. That’s the other thing that’s common is the perspective of put it out there in the wild, get people to use it, learn from it, and change it. That’s great in theory and it works many parts of the time, but the downside of that is you’re potentially putting out really bad product experiences and you are taking a debt – a hit on trust. It takes a lot longer to build back trust than it does to actually invest in making sure that you have tested something before it gets put out there that doesn’t hit the trust threshold. Adam: You’re balancing two pretty important factors there. One is that there’s only one chance at a first impression, whether that’s a product, feature, blog post, marketing asset, etc. The other is that at the same time, shipping is only the beginning of the process. I always remember testing to 1% of the population for Facebook. 1%, when I was there, was the country of New Zealand. New Zealand gets the latest and greatest Facebook experiments, and Facebook gets to learn from that sample set. The country of New Zealand. Then they have a rollout strategy. They test, they iterate, they evolve, and then when they have high confidence, they’ll go from 1% to 5%, iterate and learn. When I started at Autodesk it was the same philosophy. I’d hear they were going to put stuff out in the wild and test it. Fantastic, what percentage of your user base are you testing? If the answer is all, that’s not testing. You have to know the difference between testing and releasing. Adam: What you’re going to learn is it’s too late to fix at that point. Maria: Then you’ve built the debt, right? Big companies, small companies, they all grapple with the value of research. The other lever I pull is if you’re not going to invest in hiring a researcher or researchers, you’re having your developers and your designers doing the research activities, which then slows you down. You have one person who has to stop and do what they’re doing, do the research, start up, and design or build. Having a researcher makes the process move a lot more efficiently because they get to work concurrently with the other disciplines. Adam: You’ve said that unlike physical products, emotion still isn’t considered as much as it should be in digital product design. Facebook is a great example of a place that does consider this. Same with ridesharing apps. We know that the cars on the map may not be accurate, but you get these little moments of delight from seeing them move. Who else is doing this well and what can we learn from them? Maria: I think something came out about Uber that when you actually launch the app and see the cars in the ecosystem, that’s not really an accurate depiction – but you don’t care. You just like seeing cars on the road. That delightful experience of ordering a car and then watching the car pull up, it’s not necessary, but it creates this level of delight that propelled Uber into the stratosphere of good user experience. Now, you have all of these other ride share applications doing exactly the same thing. Airbnb pays a lot of attention to delight, both from their product experiences for hosts and the guests. The founders of Airbnb were designers, so it makes sense. They came from RISD. That level of emotion is really important and not to be discounted. There are a lot of studies that talk about how adding that level of emotion and craft to an experience improves trust, but customers actually feel like the product works better too. When something’s well crafted or adds a level of emotion, they not only trust the product, but they actually think that the product functions and works better. Adam: Speaking of designers as founders, your latest book, Rise of the DEO: Leadership by Design, is nearly 3 and 1/2 years old now but it still feels as pertinent as ever. How have design leaders changed the product landscape in the time since you’ve released that book, and what might you add to the book today that you didn’t previously? Maria: Yeah, it’s interesting because when you look at Rise of the DEO, it’s not necessarily time sensitive. I spent years of doing research and trying to identify those patterns that comprise of these special types of leaders. In a sense it’s evergreen content because these leadership traits don’t really expire. Over the last couple of years, there are a few traits that are even more important. Social intelligence is a big one because nothing is done in isolation anymore. We’re increasingly a global society, we have to have empathy across borders, and social intelligence really is a driver for connection and empathy with people. I would probably look at that section and try to beef it up. It’s a very, very important skill. The other one is systems thinking. As systems get increasingly more connected and complex, the need for people to really understand the root causes of systems and how you can solve problems through systems thinking, that trait becomes more and more important. Adam: What do designers who aim to grow into a leadership role in the future need to be working? Maria: The DEO, Design Executive Officer, is more of a mindset than it is a position. There’s no such thing as a DEO – although, some people have written me and told me that’s what they’re calling themselves, which is so awesome. It’s really about embracing the mindset to drive change at any point, whether you’re an intern, a middle manager, or a designer on a design team. You can do all of these things wherever you are in the process and that’s what the book is really centered around, how you can drive change based on where you are in the company. I talked about unionizing and finding like-minded people, making sure that you are empathetic and care about the people, not only the people that you’re designing for, but the people that you’re working with. How to be much more systems oriented, especially if you’re on a design team and you’re only relegated to solving a very discreet problem, it’s really on you to understand how that problem is in context to the larger picture – whether or not you’re asked to do so. Don’t just leverage your creative skills, but make sure that you are driven towards craft and flawless execution. Do all those things well, and you’re going to be emulating what a DEO does. Adam: Thanks for joining us, Maria. Are there any speaking events where people can catch you in the near future? Maria: I’m going to be speaking at the UXI Conference in Tel Aviv in March. Then I’m at the World Usability Conference in Austria later in 2017. Then there’s a bunch of places here and there in between that.